Islands are pieces of land surrounded by water. Some are really small and uninhabited by people, whereas others were once homes to early civilizations, and are now independent cities or countries. Since many islands are not so industrialized, and have managed to preserve wildlife and nature, they offer a perfect escape from busy and noisy cities for millions of people. French Polynesia is a French overseas territory in the South Pacific Ocean. It includes around 120 islands. Its capital is located on the island of Tahiti. 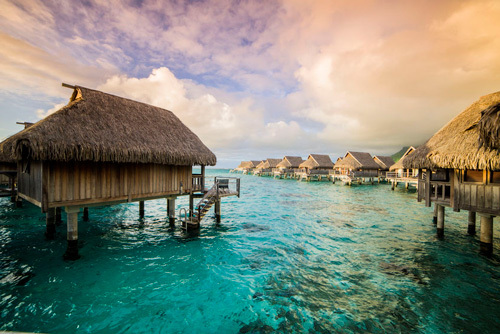 Bora Bora is situated approximately 140 miles (225km) northwest of Tahiti. A major tourist destination, Bora Bora is a group of islands in the Pacific Ocean. These wonders of nature got their name from the local Tahitian expression which means "created by the gods" (pora pora mai te pora). The main Bora Bora island hosts remnants of an extinct volcano which is also the highest peak. The true beauty of this island lies in the lagoon and the barrier reef which surround it. A lagoon is an area of sea water that is separated from the ocean by rocks or sand. Many resorts are located on smaller islands around the lagoon. Because of the amazing and diverse ocean life the lagoon shelters, snorkeling and scuba diving are some of the most popular activities, where tourists can also see sharks and rays (a ray is a sea fish with a largeflat body and a long tai)l.
Fun fact: There is no public transportation on the islands, so tourists need to either know how to drive or ride a bicycle. Indonesia a country consisting of a group of islands in South East Asia. Bali is the most popular island holiday destination in Indonesia. Unlike most other islands, Bali is a crowded place, with its 4 million inhabitants and many thousands of tourists coming in daily. It is also home to the most diverse coral reef population, with more than 500 species found. 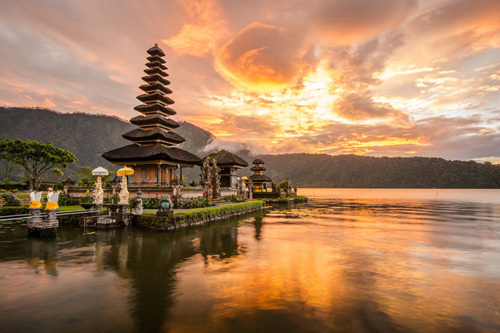 Known as the Land of the Gods among the locals, Bali hosts active volcanoes, rice fields and white sand beaches. It is visited by many adventurers, as it is possible to surf and dive in the ocean, raft in white river waters, go bungee-jumping on one of the cliffs, as well as mountain climb. Fun fact: Bali is ruled by a unified confederation of kingdoms. There are 10 traditional royal houses on Bali, each having control over one area of the island. This African country is in fact an archipelago of 115 islands.  Aarchipelago means a group of islands and the sea surrounding them. The main island, Victoria, is where tourists can learn about the culture of the country, and visit the main Hindu temple and Natural History Museum. Many Seychelles' beaches are untamed and not crowded at all, which is why many turtles feel safe there, so they come ashore to lay their eggs. Nearly 90% of the country is covered in forest, so the islands are a top destination for all lovers of wildlife and nature. You can observe some of the 275 species of birds which live on the island, or simply enjoy locally-grown exotic fruit. 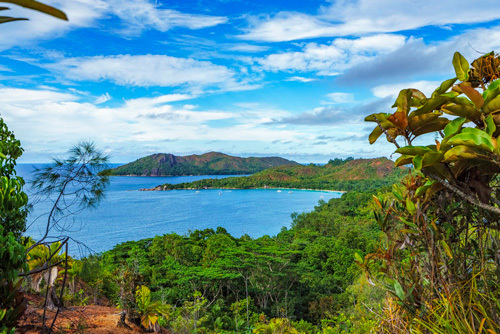 Fun fact: Due to their favorable location, the Seychelles were used by pirates until the French took over the islands in 1756. 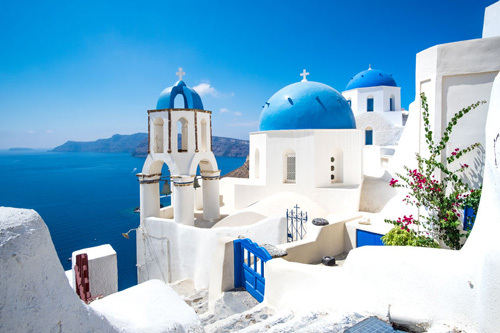 Greece has over 200 inhabited islands, yet Santorini is one of the most popular ones, due to its unique white cubical houses and churches with blue roofs. Located in the Aegean Sea, Santorini was named after Saint Irene (a contraction of the name Santa Irini) during the Latin Empire. The current island is what remained after a great volcanic eruption destroyed earlier settlements of the Minoan civilization. This is why very high, steep cliffs are found on three sides of the island. Besides amazing views and architecture, tourists are also drawn to Santorini for its wines and traditional cuisine. Santorinio Sfougato, a vegetable dish served with local milk cheese and herbs, is highly recommended. Fun fact: Before it was renamed Santorini, the island was known as Kalliste, which in Greek means "the most beautiful one". 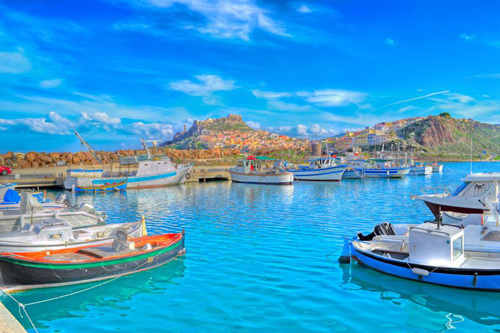 One of the largest islands in the Mediterranean Sea, Sardinia was also home to one of the earliest human settlements in the region, named after Sardo, a legendary woman who was born in the ancient Kingdom of Lydia (modern western Turkey). With nearly 2,000 km of coastline, Sardinia is filled with spacious sand beaches such as Costa Smeralda, having both remnants of ancient traditions and a vivid nightlight. For those interested in history, the Nuragic complex includes monuments dating from more than 3,500 years ago, spread across the island. There are several popular festivals taking place in the capital Cagliari where you can see traditional Sardinian clothes and hear music unique for the island, produced by launeddas, a three-pipe wooden instruments invented in Sardinia. Fun fact: There is a lagoon in Cagliari where you can see several colonies of flamingos. There are many __________ cliffs on Santorini. In the Cagliari lagoon, you can see flamingo __________. Some __________ civilizations lived on islands. Bali hosts many __________ volcanoes. On the Seychelles, turtles come __________ to lay their eggs. Sardo was a __________ woman from the Kingdom of Lydia. 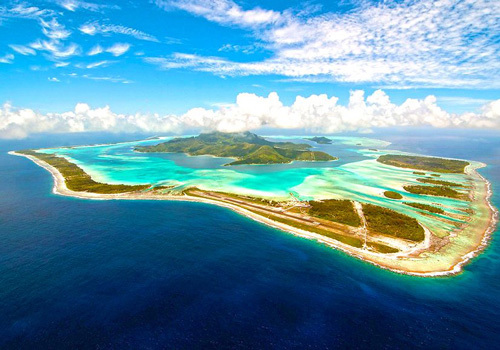 The Bora Bora islands got their name from a local Tahitian __________. Delicious traditional cuisine draws tourists __________ Santorini. You can enjoy some of the locally-grown __________ fruits. Costa Smerlada is known for its __________ nightlife. What surrounds the main Bora Bora island? How was the Minoan settlement on Santorini destroyed? Why do turtles feel safe on the beaches of the Seychelles? Where on Sardinia can you see ancient monuments? Who has control over the island of Bali? In Bali, you can both surf on the sea and raft on the river. You cannot raft in Bali because there are no rivers. In Greek, Santorini's current name means "the most beautiful one". In Greek, Santorini's previous name means "the most beautiful one". "Santorini is surrounded by beaches from all sides of the island." "There is no danger that the Bora Bora volcano can erupt."